First step is to configure your goal. A colleague and friend of mine, Karl Iuel at Avanade, suggests Goal Management is better thought of as KPI Tracking and I really like that description. 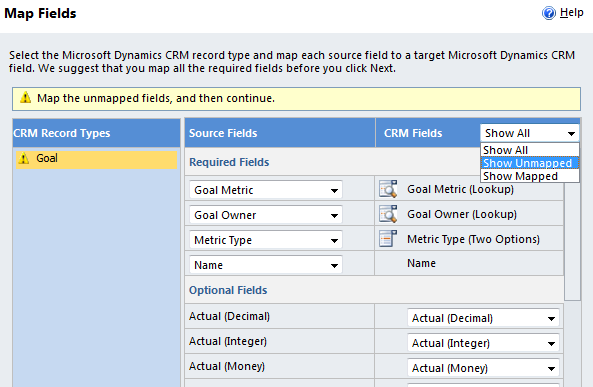 As you go through the process of configuring your Goals you will see CRM’s goal design is less about goals/targets and more about the tracking of actuals. So, lets setup a KPI that we want to track and load a target against that KPI. For this scenario we want to the track “the sales revenue booked each month by each rep”. We will determine this from the Actual Revenue Amount on Won Opportunities based on Actual Close Date and Opportunity Owner. 4. Define the Rollup Field as shown below. What we’re doing here is asking CRM to keep a running total of the Actual Revenue field on Won Opportunities, using the Actual Close Date to sum by fiscal period. 5. 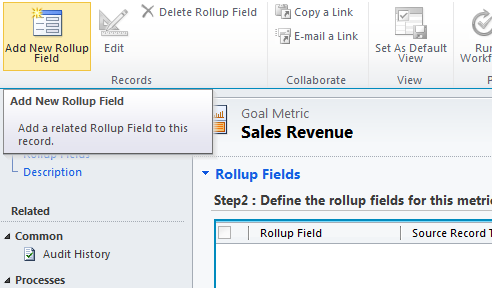 Save and Close the Rollup Field form and you will be returned to the Goal Metric form. You’ll note that the Goal Metric record is really just a bucket for a collection of Rollup Fields. The KPI definition is really at the Rollup Field level. At this point we could add a second Rollup Field to provide an “In Progress” measure – e.g. a KPI of the Est. Value sitting on Open Opportunities – which would obviously useful when comparing sold vs target as it provides visibility of what the rep has the pipeline to close that gap. For this scenario we will skip that step. Note: In some scenarios you will need to take a few extra steps to further refine which records should be included. i.e. 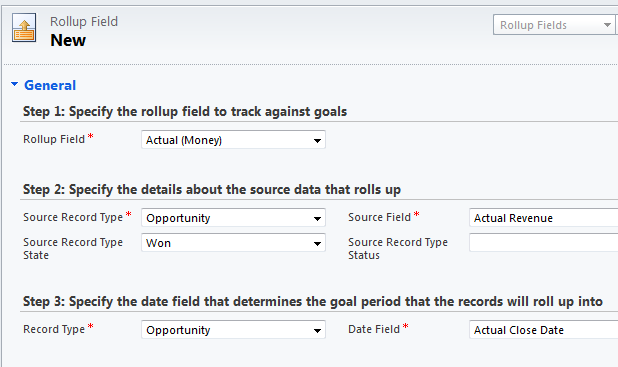 on the Goal record you can chose whether for each user only their own records should be counted (the default) or whether all records regardless of owner should be counted towards the user’s Goal (not sure when you would go with this option). Sadly, if you want to filter based on the user in another way – e.g. based on who created or last modified the record – I think you’re out of luck. Another option you have is to define a Rollup Query – essentially an Advanced Find set of criteria – to only count records that meet certain criteria – e.g. 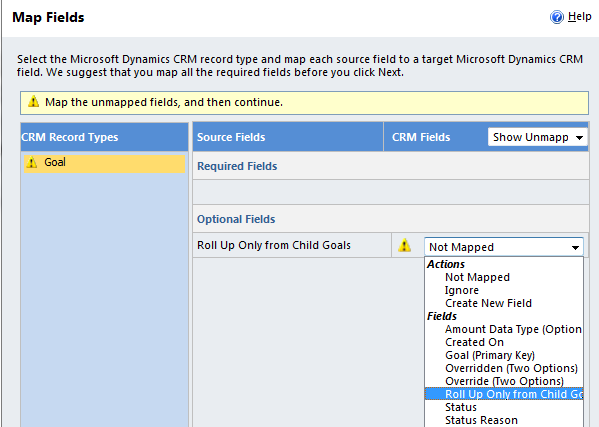 if you wanted to set regional goals for each user you could create a rollup query for each region, and as you enter the goal for the Southern region you would specify the Southern region rollup query should be applied, which instructs CRM to only count opportunities related to the Southern region. For our scenario we want all Won Opportunities based on owner so we don’t need anything else. 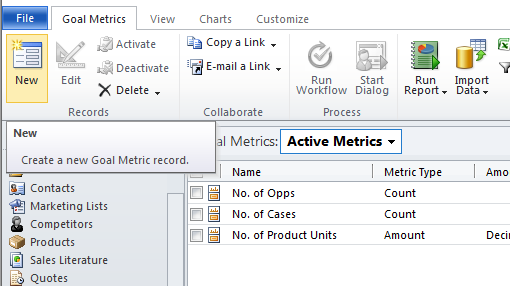 Now, as much as we have defined the Goal Metric we want CRM is only going to keep track of the metric for those periods and reps that we have entered Goals for. 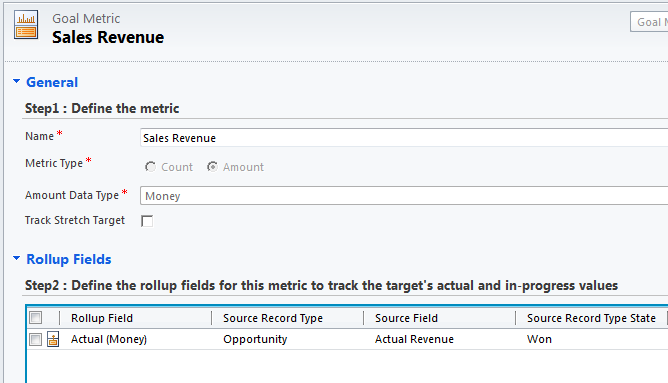 As a consultant I’m used to saying “why bother setting a target if you’re not going to measure the actuals” – well, with CRM now the reverse is also true – CRM won’t bother tracking an actual unless you bother to set a target. And its it at this point that you’ll start to recognise the need for a bit of (ick!) data entry – or (even more ick!) data migration. How come? Well, lets say you have 200 reps and they each have quarterly sales targets, that means 800 Goal records need to be entered into CRM. I smell an ISV opportunity! But hey it’s easier than that, let’s make use of our good old friend Excel to help us out. 8. You will be prompted to download an XML file. Save this to your desktop and then open it in Excel. Ok, now I think this is pretty cool, CRM has gone and dynamically created an XML file based on your meta data giving you a template data import file with a bunch of validation and comments built in. You’re likely to have this data in Excel somewhere or in your ERP system where you can easily get it out to Excel, so you should be able to easily populate this template with a bit of creative copy and pasting. 10. 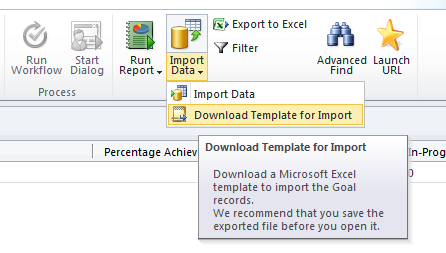 Save your Excel file (you can stick with the XML format). … and then mapping the source value of (empty) to the value “No”. 14. And you are done. 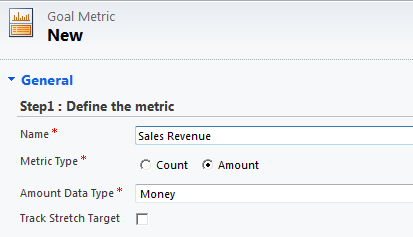 Your quarterly targets are loaded for each Rep, and CRM will track sales revenue against those targets. Now go check out the dashboards, charts and reports now available to your users. Cool stuff. This entry was posted in Uncategorized and tagged 2011, crm, Goal on January 28, 2011 by Gareth Tucker.